Puff st: Yarn over, insert hook into the stitch, pull through loop until it is as tall as a dc. Now with three loops on your hook, yarn over, insert hook into the same stitch and pull through until it is as tall as the last pulled. Now you have 5 loops on your hook. Repeat three more times until there are 11 loops on your hook. Yarn over and draw strand through all 11 stitches. Close with chain stitch by yarning over and pulling through. 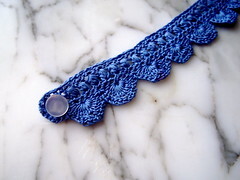 Shell st: Single crochet (sc), then skip two chains and double crochet (dc) into third st 12 times (fan made). Skip the next 2 st, and sc into third st.
Ch 2 (counts as first dc), dc 1, ch1, *skip st, puff st* repeat from * across to last 2, dc 2, turn. Thanks for the fun tutorial. Very pretty pattern. Mini Purse Swap has Arrived!